The recent advice from the chief of Australia’s navy  that the first Shortfin Barracuda may not come into service until the mid-2030s is sobering news given Australia’s deteriorating strategic circumstances  and the critical role the submarine capability plays in our defence force structure. Under some scenarios , we may not have all 12 future submarines until as late as the 2050s. With a highly developmental program and tough bilateral negotiations in concluding the overarching strategic partnering agreement, it’s highly likely that further slippage in the schedule awaits. The reality is that the Collins-class submarines will have to provide our frontline submarine capability for much longer than planned. The Collins will require a life-of-type extension (LOTE) or a rolling update program to avoid obsolescence  and sustain its capability edge  over growing regional threat levels. It’s time to inject some competition and provide an option that could avoid the issues with the future submarine program that appear to be unfolding—an option that could provide additional submarines quicker, cheaper and with less risk. The solution is an evolved Collins, building from what we know, based on our existing sovereign submarine capability, hard won by toil and treasure. This solution is feasible, provided decisive action to initiate the program is taken now. A significant amount of concept design work was undertaken on this option in 2014–15; however, it wasn’t taken into the competitive evaluation process  because of concerns over Kockums’ capability, capacity and credibility. Since that decision was made, Saab has established a rejuvenated Swedish submarine design and build capability. This has been demonstrated by the recent successful update to Sweden’s Gotland-class submarines and the design and commencement of construction of the new A26 submarines for Sweden. Saab and Damen are bidding an evolved Collins design  for the Dutch future submarine requirement. All of this work would provide a useful start to a preliminary design study to refine the design and costing of an evolved Collins to meet Australia’s requirements. The arrangements for ownership of intellectual property agreed for the earlier work could provide a basis for an early agreement on these matters. The facilities required for an evolved Collins build should be determined during the study, to optimise use of the existing ASC facilities in South Australia and Western Australia for the build and for ongoing Collins support, facilitating an early start and minimising the expense of new facilities. Although constructed in a new shipyard with an inexperienced workforce, the original Collins class was built at a cost that was consistent with international benchmarks and with the first submarine being commissioned within nine years of commencement. Were that performance to be matched in the evolved Collins, and based on the benchmark costs for constructing submarines established in a 2012 Kokoda study , 12 evolved Collins could be delivered at an estimated sail-away cost of around $20 billion, with the first boat being commissioned in 2030. Potentially this compares very favourably with both public-source estimates of the cost of the Shortfin Barracuda and its extended delivery schedule. Importantly, the risks involved in an evolved submarine design are considerably lower than those associated with an ab initio program. Much has also changed in the capability of the Collins class, which is now delivering better than international benchmarks for availability thanks to efficient sustainment by the submarine enterprise, led by ASC and supported by an extensive, reliable Australian supply chain (over 90% of Collins sustainment funding is spent in Australia). There are significant efficiencies in integrating the Collins LOTE and the evolved Collins design and build. This will optimise Collins capability, while reducing costs, lowering risks and maximising Australian content in both programs. A preliminary design study led by ASC, supported by Saab, should be used to confirm the details. The process should be managed by a dedicated submarine capability team, similar to that established by the Howard government following the 1999 McIntosh–Prescott report  into the Collins class. This will avoid bureaucratic delays and any impact on the Shortfin Barracuda design program. A contract for the study issued by mid-2019 would enable the study results to be delivered at the end of 2020. This approach would cost around $50 million, or 0.1% of the SEA 1000 prog r am cost , and offer good value for money to generate an alternative option. 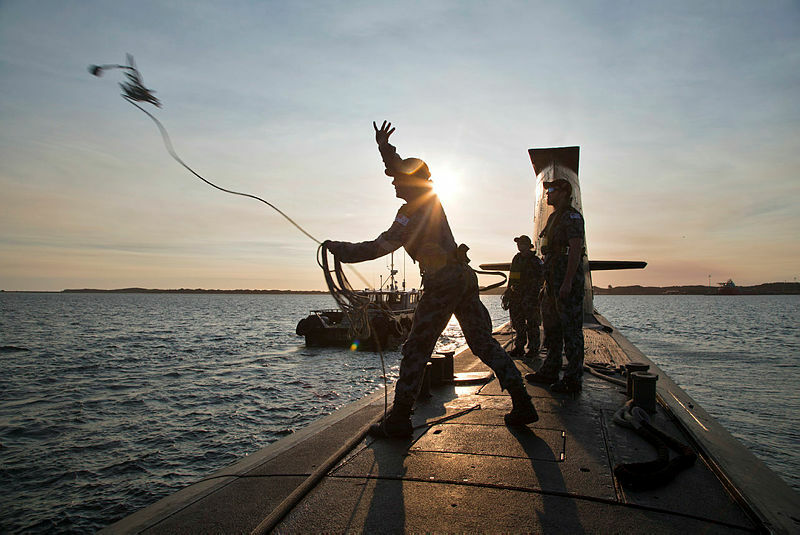 An evolved Collins and integrated Collins LOTE program has the potential to leverage off our hard-won sovereign submarine capability and provide an increased submarine capability sooner, with less risk, with higher Australian content and at a lower cost than the Shortfin Barracuda program. While not causing any delays in the Shortfin Barracuda program, it would also inject some much-needed competition into the process and provide the government with two valid options to choose from in late 2020. Decisive action is required now to avoid a submarine capability gap in the critical 2030s. Each day spent on debate reduces the time available for designing and building Australia’s future submarine capability. Peter Briggs is a retired submarine specialist and a past president of the Submarine Institute of Australia. Image courtesy of the Department of Defence.